Rogue Valley is at the extreme south of Oregon and very close to the border with California making it a much warmer place than one might imagine. There is a diversity of grapes here that I wasn't expecting to find. It gets very hot from May to October with almost no rainfall during that period. If the Willamette Valley is akin to Burgundy then Rogue Valley is the South of France! A quick presentation before dinner confirms the suspicion that we are indeed ‘golden ticket’ owners. The thrill of adventure can be felt but for now it is time to go to bed for a well-deserved sleep. I am not sure about American coffee but they have a pancake machine - I am not sure if this is a great or a bad thing. We get ready to go to Del Rio Vineyards to try some of their wines with neighbors Roxy Ann and Kriselle Cellars. Chardonnay and Pinot Noir are represented but there is also Cabernet Sauvignon, Cabernet Franc, Viognier and Tempranillo. This diversity is a result of two main characteristics: first is Rogue's valley variety of altitudes which range from 600 to 2400 feet (180-730 meters); second is the fluctuation of temperature. This morning is 10 degrees Celsius but this afternoon, it will go as high as 30. This diversity will certainly one day lead to the creation of new, smaller AVAs (American Vinicultural Areas). The huge level of rain in the winter and spring is key to keeping enough reserve as there is very little rain in the summer. There is therefore no disease pressure but maintaining good acidity levels, especially in the last few years where temperatures have been high, is a constant concern. Fortunately high altitude and proximity to the cool winds from Pacific will help even if it keeps warming up. Lunch and a visit to Abacela winery was our last appointment in Southern Oregon. This is a winery driven by its love for the Tempranillo grape. Two scientists left their secured careers to follow their dream and plant the grape; their goal - to remedy to the lack of fine Tempranillo being produced in America. They believed it has a lot of potential in the climate and terroirs South Oregon can offer and on the results it was hard to argue with. It was time to head up north to Portland, where the long drive allowed me to get to know a few more of our comrades. 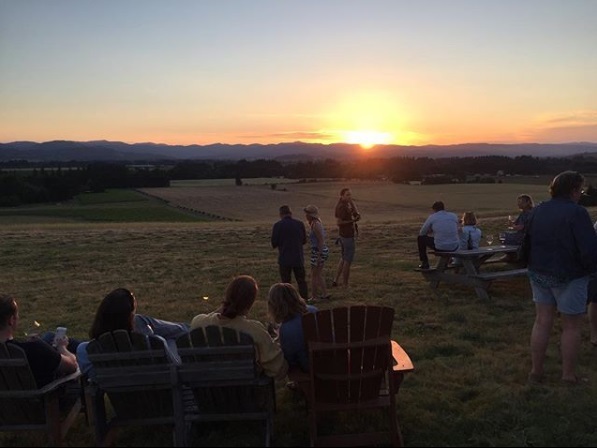 Tonight we were heading to SE Wine Collective, a cooperative winery located in the South East of Portland where young winemakers who haven't enough cash flow or land can buy grapes and have a place to produce their wines. This place was the very image of its city, young, dynamic, ambitious and very cool. Beards and tattoos are well represented. Hackney isn't alone! That being said, most of the wines were delicious: unpretentious, fun and creative. Portland is a place where 70's hippies meet the millennial hipsters. A very good address to stop by in The City of Roses. Saturday was the transitional day as the international group were meeting up with all the other 250 ‘Pinot Campers’ later tonight. 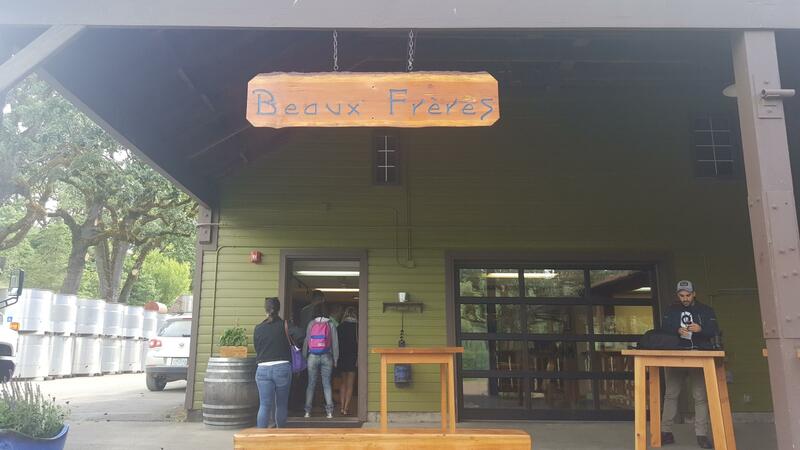 First of all we were off to Beaux Freres winery, famous for being the only winery in which Robert Parker was directly involved. We were welcomed by founder Michael Etzel, (Bob's step brother) who directed the visit and tasting. The Chardonnay and Pinots were all amazing but especially their Upper Terrace which showed fine texture and delicacy but long length of flavours. (Special mention to their excellent craft beer which they produce from hops grown at the estate.) A quick visit through the vineyards shows how healthy the vines are; these are vineyards full of life in term of micro and macro biology but also in the literal sense of the word as Mexico won against South Korea at the world cup (most of the vineyard workers in this area are Mexicans). Traditional music can be heard throughout the vines. Viva Mexico! The next visit was Bergstrom. We tasted a couple of Chardonnays with bright acidity and made in a reductive, mineral style. Then we had comparative tasting of Bergstrom Vineyard, Shea, Sicilice and Le Pre du Col across the 2015 and 2011 vintage, the latter being a cooler year which is already showing development and maturity. These Pinots are beautifully made and the difference of each terroir is certainly coming through on each cuvée. Lunch at Drouhin was an opportunity to focus on tasting the Chardonnays from all 52 participating wineries in the region. While Pinot Noir is the main grape in Oregon, it is important to note that more Chardonnay is being planted – a direct response to the huge growth in popularity (once again) of this fine grape, particularly in the domestic market. There is a wide range of styles being produced, from the beautiful crisp light white to the more buttery, rich full bodied style. Both styles matched very well with crabs which were happily shared with other Pinot-Campers while looking at the stunning views from Drouhin’s winery! Later we drove to our hotel in McMinnville, the place where we would be staying for the next three nights. Pinot Camp has officially started. We arrived at Sokol Blesser winery where all 52 wineries were showing their wines. Evening Sunshine, Paella, and loads of Pinot Noir: what more do you want? Well, after talking with Jason Lett from Eyrie Vineyards, we were told the vines which his father had planted in 1965 where right next to Sokol Blesser. He kindly led us to the vines - which are the oldest in Willamette Valley. It almost felt like walking around a museum; a pioneering work of art followed by so many. 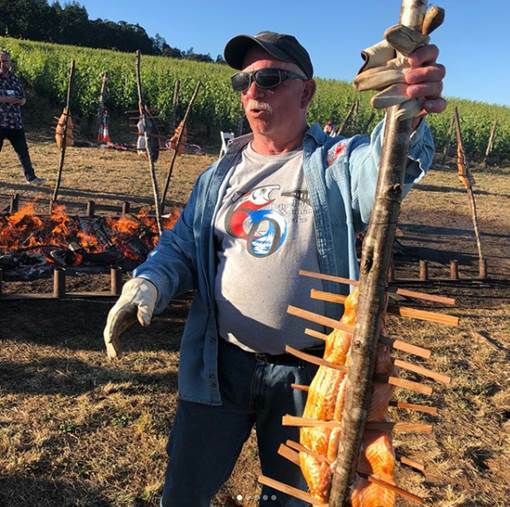 Each winery quickly introduced themselves to the audience before Jason Lett presented The Oregon Pinot Noir story (link available below) which is a very instructive introduction of what Oregon wine is, its climate, geological history and its innovations. But also what and who has made Oregon so special to this day. It was time to get into the Green Bus, which had been decorated by our Captain Rachael. Excitement can be felt. The sun is shining and temperatures are expected to get to the mid-30s. The first workshop is about soil and how it affects the root systems, the vines and the grapes. 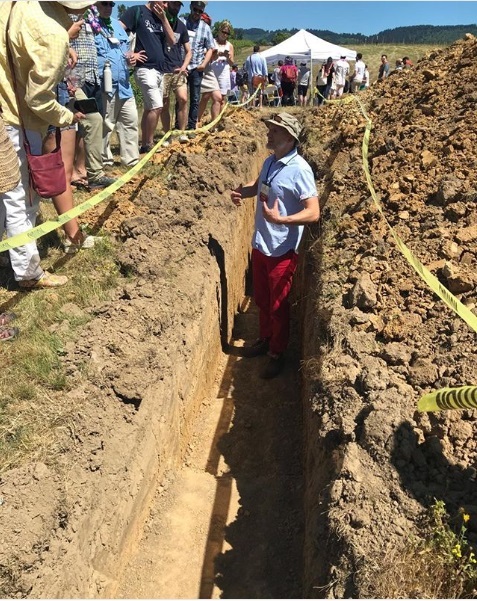 Soil pits have been dug and test wines have been made to help identify if the soil specificities can be detected in the glass. Intensive work has been done to show us what is happening underneath and how the soil comes into play in agriculture. We only know about around 10% of the soil life, and by understanding it better, viticulture can be better managed. The second workshop is about how to grow great Pinot Noir: which trellis system, which clone to use, rootstocks, on which sites, at which density – just some of the many factors which come into play. This was supported by further comparative tastings. For example, do two wines only separated by trellis system, in this case VSP (vertical Shoot Positioning) and Scott Henry, actually present themselves differently? The answer, amazingly, is yes. And as marginal these differences might be, all these criteria put together certainly will have a huge impact on farming quality grapes. Both workshops took place in the vineyards. The knowledge given by all viticulturists was top level and the comparative tastings showed how important it is to understand what is happening in the vineyards. We all drove to Anne Amie vineyards for dinner where 26 of the participating wineries were showcasing library wine in large formats. The views over the valley during sunset were incredible. As soon as the sun went down, cooler wind came through and this certainly plays a key role here to in keeping the grapes cool and fresh. Monday was a deeper look into winemaking and what can be done by the winemakers when receiving their raw material from the vineyards. We arrived at Bethel Heights and after a burrito breakfast started to get into the winemaking details and comparative trial tastings. 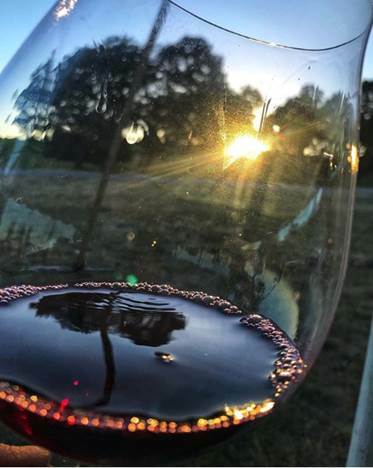 We went through what sort of decisions winemakers face, and how to integrate these factors of which they are in control with the ones that are outside of that control. Harvest decisions, determined ripeness, sorting table, destemming or whole cluster, pre-fermentation option, fermentation in stainless steel or wood, less or more extraction, and which ageing method to use. Each of these factors has a huge impact on the finished wine and the comparative tastings showed that each of these has a really obvious effect. The most striking were: destemmed fruit versus whole cluster; fermentation in steel versus wood; and short versus long maceration. We then drove to Van Duzer Vineyards to try and understand the different personalities of Pinot Noir. Van Duzer is also named after the huge wind corridor which comes through and spread all over the valley. Six wineries were blind tasted then discussed in groups before sharing comments with everyone. First was to compare different vintages and understand the ageing difference which can occur not just from vintage and place difference, but also winemaking techniques and philosophies. We explored the vintage and regional personalities, but also looked at how much of an impact human intervention brings about. The last workshop was about white winemaking and how suitable it is to Oregon, what are the conditions required, how specific and different it is to red winemaking and what styles can be identified for Chardonnays, Pinot Gris and Rieslings. Again we had a very instructive comparative tasting which showed how much terroir, viticulture and winemaking techniques produce different styles for one single grape. The last dinner with the campers happened at Stoller Family Estate and was truly fantastic. Salmon baked over a huge open fire and served with a delicious buffet. Not to mention the other 26 wineries were also showcasing their library wine in large format. These included some of the first Pinot produced in the area, going back to 1974 (amongst plenty of other top wines). A country music band was even playing live songs about Oregon Pinot Noir - a truly memorable moment. I wish every day was like this! After a few s’mores over the remaining embers, it was time to leave but once again the night wasn’t quite yet over. 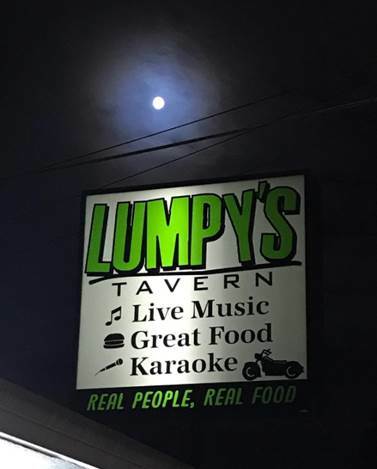 What has become a tradition on the last day of Oregon Pinot Camp is to go to a karaoke joint called Lumpy’s. Over the past few days we had been briefed on the venue - which receives diverse reviews. Some love it and described it as “a must-go”. Others absolutely hate it and strongly advised us not to go. Well, to cut a long story short, hundreds of us went there and took the place by storm. Some bad but also very good singing occurred and I am afraid I was most likely part of that first group. It didn’t matter much in that context and the party with all the campers was insane. What an incredible last few days. Those memories will stay with me for a long time. I guess you could also say that to the camper who ended up with a new tattoo of the words OPC 2018 (Oregon Pinot Camp 2018). No Joke! 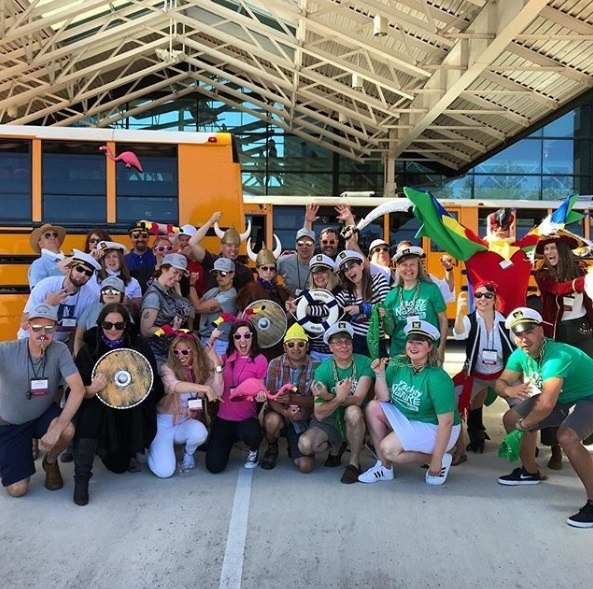 The last day was organised into small groups where wineries planned light-hearted "recovery" events. We drove to Ponzi Vineyards to Zen out in the Chehalem Mountains where we had an epic multi-course omakase lunch crafted by the sustainable sushi masters at Portland’s famed Bamboo Sushi. It was relaxing and certainly a lot less dangerous than outdoor shooting (one of the other 9 activities). We drove back to Portland for an after party which also featured small wineries which weren’t able to participate in the Camp. There were loads of very exciting, small production, sustainable projects which make very attractive wines. We went back to our hotel in downtown Portland and had a couple of beers since the hundreds of wines I tried over the past few days completely saturated my palate. 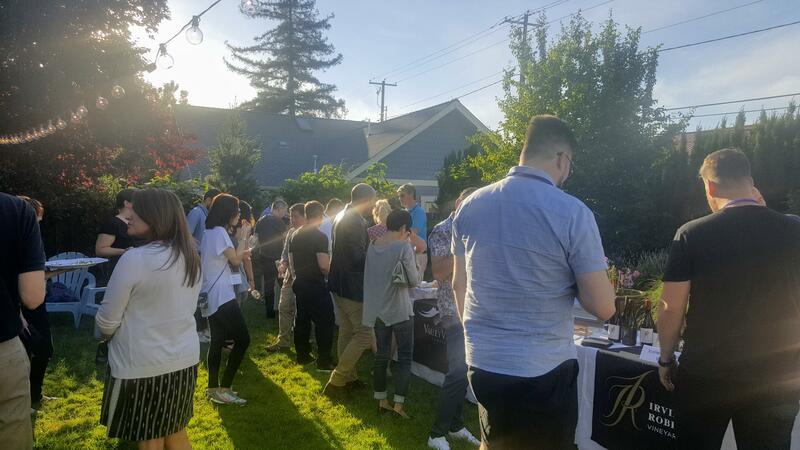 This event really shows the dynamism here in Oregon: the friendship and collaboration between each winery in order to learn more about their soil and experiment is something many other wine regions should envy and replicate. The knowledge shown in the viticulture and winemaking workshops were of the highest level while staying fun. 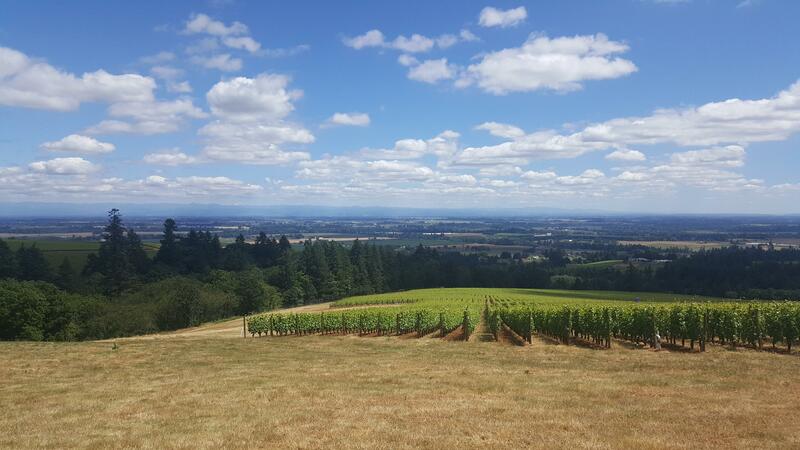 It is clear Oregon is not Burgundy, but there is no doubt it can produce world class wines. It is time to say goodbye to the great people I have meet along the way; I know now that in Tokyo, Hong Kong, Melbourne, New York, Montreal, Toronto, Vancouver, Stockholm, and Madrid there are people I can drink stunning Oregonian wines with. It is always sad to end what was been an incredible week but the memories and friends I have made on the way were nothing short of spectacular. As I reflected whilst waiting for my flight back to London: this has been a true once in a lifetime experience. Oregon, you won! Thank you again to the Oregon Wine Board and in particular Margaret and Tom who made this trip even more special.